Garlic and Sea Salt: Tabouli with Mango? I love tabouli! Especially when it is made with quinoa to make it more nutritious. So I was feeling like some tabouli, but I had no tomatoes, parsley or mint, which to me are essentials in a classic tabouli. So I decided to improvise and make tabouli with mango in place of the tomatoes and basil in place of the mint and parsley. I threw in a few pine nuts as well...since this was becoming a non-traditional tabouli anyhow. What resulted from my throw together tabouli was a super refreshing summery salad which I will definately be making again until the cool weather comes back in the fall. 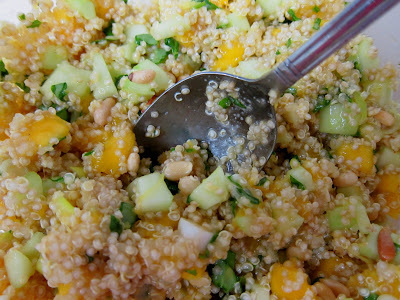 Try it out if you would like a little different take on the classic grain salad! Place quinoa and water in a medium saucepan and bring to a boil. Reduce to a simmer, cover and cook until all the water is absorbed about 15 minutes, or when all the grains have turned from white to transparent, and the spiral-like germ has separated. Drain, and let cool. When quinoa is cool, combine with the mango, cucumber, basil, scallions, and pine nuts. Whisk together olive oil, lemon juice, lemon zest, garlic, and sea salt and freshly ground pepper to taste. Toss dressing with salad, and chill. Looks delicious. I love quinoa. Thank you for sharing this recipe. This looks so refreshing and good, I will have to give this a try, great idea! That sounds delicious! I love mango. What a great pairing. Very nice dish. You could have easily turned it into a Thai dish with the mango by adding some scallions and lime. So fresh and perfect for summer! 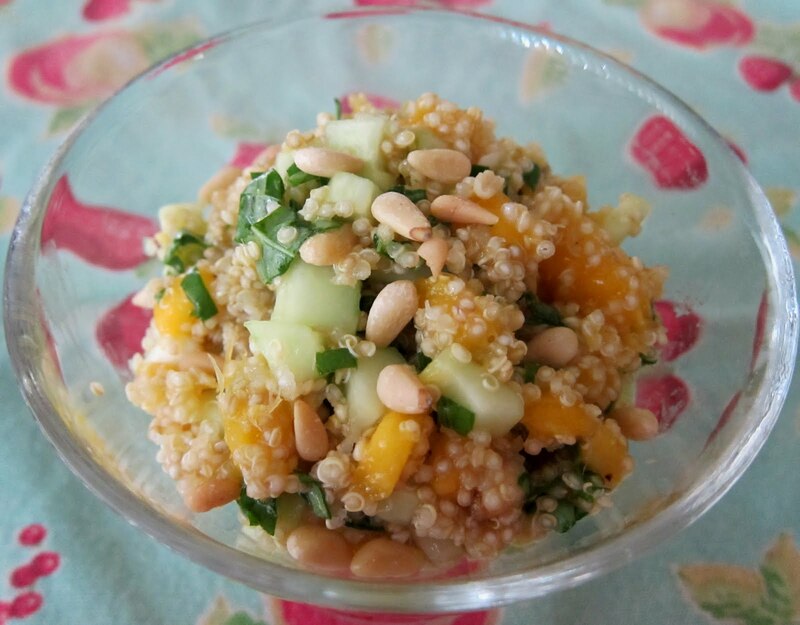 The quinoa is genius, it makes it so healthy!